Somebody's mother once said, "if you don't have anything nice to say, don't say anything at all" so our post on Hanoi will be short. It may be that it felt the least accessible of any place we've been on our trip so far, and most of the time we felt that no one wanted us there, or maybe we stayed in the wrong neighborhood, but overall Hanoi was our least favorite place. We stayed in the Old Quarter ("the" place for tourists to stay) and it was terrible! Despite the great hotel we found (the Tulinh Palace Hotel), the sidewalks are completely taken up by scooters, street restaurants and shops, so you have to walk in the street. Literally IN the street. I would say we walked in the gutter, but Hanoi has an interesting trash pickup service that makes that a pretty gross prospect. Because Vietnam is communist, the idea is that it is important for every person to have a job. So, shopkeepers take their trash and dump it into the gutter outside (not in bags, just trash in the street). Several hours later, a person comes by with a rolling dumpster and broom, and takes the trash away. Well, the big pieces of trash. The rest of the little stuff is just swept around for a while, giving the street a general mange. Which we then have to walk on to get anywhere. Ugh. 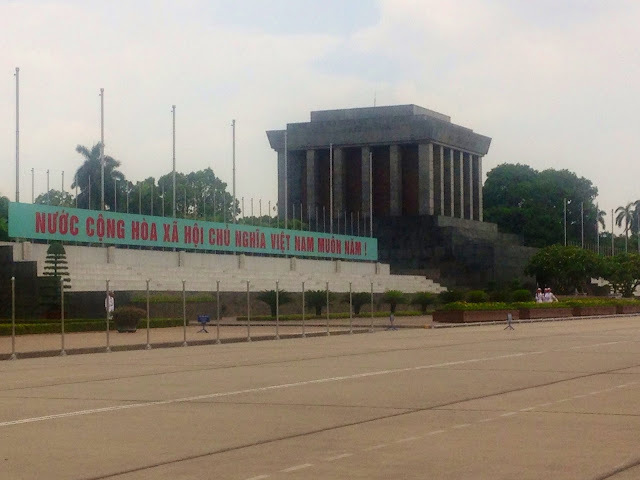 The one bright spot to Hanoi is that you can go and see Ho Chi Minh, preserved in his own mausoleum, donated by the Soviets. We arrived first thing in the morning and were directed about three blocks away from the mausoleum, so that we could appropriately enter the (swiftly moving) line, and walk the blocks back to see Uncle Ho, past a huge parade ground and up to the clearly Soviet-era building. All of this 2 by 2 walking is watched by the various soldiers on patrol, ensuring that all visitors are behaving appropriately (no laughing, loud talking, having fun, taking photographs, wearing hats, sunglasses, etc). We entered the mausoleum and this is where it got amazing/creepy/surreal. Up the stairs and around the corner, we entered a dark (and silent, despite being filled with 50 Vietnamese people) room, at the center of which was Uncle Ho. Essentially, he looked like he was having a great nap, bathed in yellow light, surrounded by soldiers on guard. After visiting Uncle Ho, we made our way next door to the Ho Chi Minh Museum, billed as a "celebration" of his life. Note that it does not bill itself as a museum to educate the visitor about his life or legacy. As such, it is not particularly educational, but is fascinating nonetheless. It takes a post modern perspective, and the museum is thus filled with art installations intended to make the viewer "feel." There's a walk through images of industrial revolution France (so you can see what he saw), there's a campfire in his brain (what?) and a room with a volcano and a toppled over totem pole (again, what?). Even though we didn't enjoy Hanoi, we suspect there is a better Hanoi there. 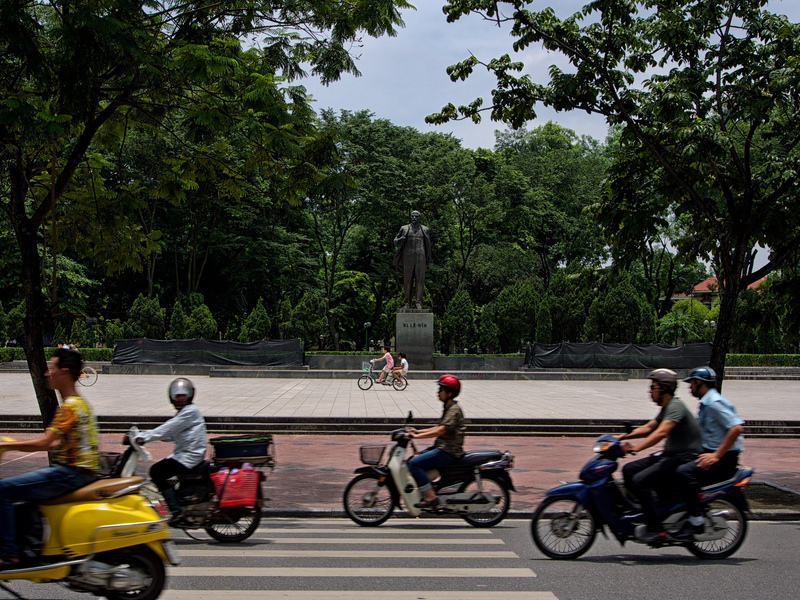 It felt very inaccessible, but maybe having a local connection or guide to take you to good restaurants, see interesting neighborhoods, and translate the museum exhibits into English, could make Hanoi a great place to visit.